For an attractive lawn that will stand up to a fair amount of wear and tear with minimal maintenance, begin with top quality, weed free turf. Make sure you lay it properly to encourage strong root growth. When it comes to mowing, ‘little and often’ is the best policy. Leaving grass to grow too long and then cutting it by more than 1/3 of its height will put it under stress and weaken it. At the other extreme, keeping it very short will prevent it from making much of its own food and the roots will dry out quickly. Weekly mowing will save time in the long run. It keeps grass in good condition, controls invasive weeds, and reduces the need for frequent feeding and watering. It’s a waste of time – and water – to regularly soak the whole garden. Some plants will wilt if they’re not watered daily in hot weather but others can thrive for weeks in parched soil. Reduce the need for watering by shading particularly vulnerable plants. Put a deep layer of mulch around trees, shrubs and on flowerbeds to conserve water in the soil. Add water retentive granules to containers and hanging baskets. When you do water, it’s far better to give a generous amount occasionally than a light sprinkling more often. If you only dampen the surface of the soil plants will develop shallow roots that are less able to withstand drought. If you grow vegetables, or have lots of containers, an automatic watering system is a great time-saver. They are easy to install and can be fitted with a timer so you don’t even have to remember to turn the tap on and off! Healthy, nutrient-rich soil will support strong, healthy plants without the need for frequent additional feeding, so any time spent improving your soil by digging in organic matter over the winter will benefit summer plants. If you don’t already make your own compost, start now. It will save you time and money next year! If your soil is poor, use slow release plant food that only has to be applied at the beginning of the growing season rather than fertilizers that need to be used every one or two weeks. One weed allowed to go to seed can generate hundreds more, so this is one job that gets a lot harder the longer you leave it. On a dry day, use a hoe to uproot weed seedlings in the morning and leave them on the surface where the sun will shrivel them. But if there’s a risk of rain, or the weeds have passed the seedling stage, you’ll need to gather them up and put them on the compost heap to ensure their destruction. As with weeding, the earlier you tackle a problem the easier it will be. 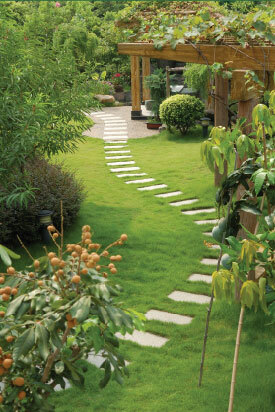 Wander around the garden every day and inspect individual plants. At the first sign of damage or disease try to identify the cause and deal with it quickly before it spreads. Some gardening jobs, like laying a new path, creating a pond or putting up fencing, take a lot longer than you might think. If you’re keen to start a project but are not sure of the best way to go about it you can save a lot of time, money and frustration by asking for expert help. Find a local professional landscape gardener who will either supply all the materials and tools you’ll need, or will do the whole job for you at a very reasonable cost.